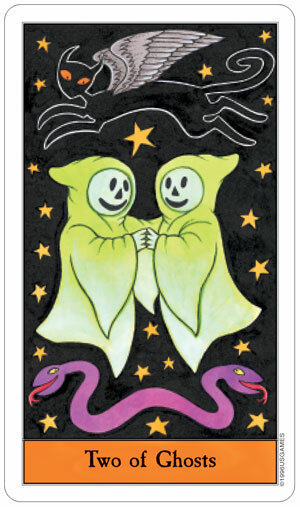 This tarot deck is ADORABLE! 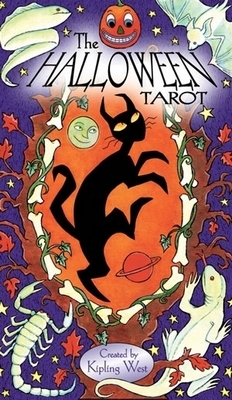 The Halloween Tarot is a fun, funky, and very readable version of the traditional tarot. A variety of pop culture monsters and well-known Halloween characters are seamlessly grafted upon the traditional archetypes of the tarot. 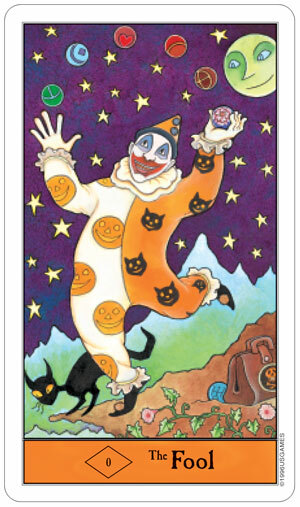 We bought this deck thinking it would be a fun, quirky deck to have. What we didn't expect was the rich symbolism it holds, and the immediate, almost childlike, connection we felt. 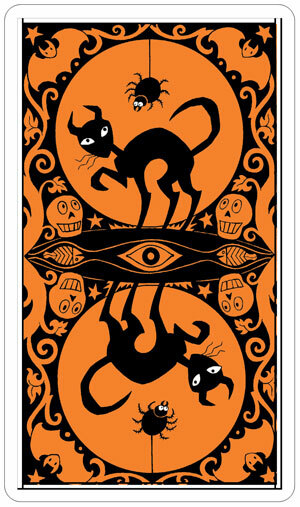 A black cat with glowing eyes appears on every single one of the seventy-eight cards of this deck. 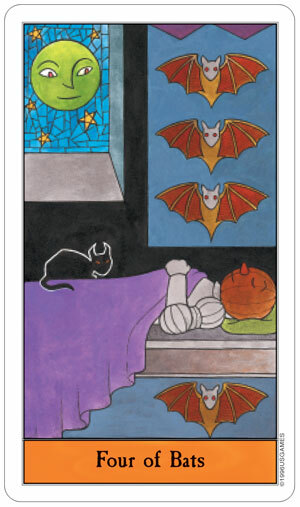 He leads us on our nocturnal sojourn through the cards of the Major and Minor Arcana. 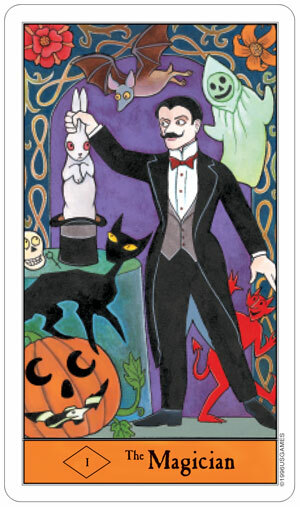 The characters of the Major Arcana visit from the realms of horror stories and Halloween tradition. Frankenstein and his bride 'bring to life' the Emperor and the Empress cards. 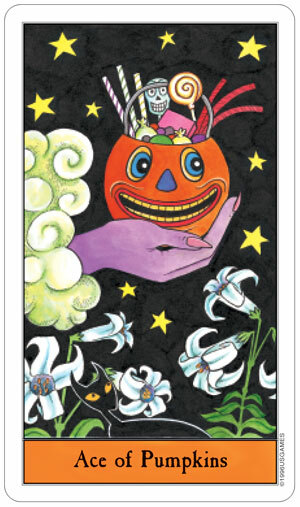 The Minor Arcana suits are Pumpkins, Imps, Ghosts, and Bats, each with a special significance. "As the suit of the ancient element Earth, the Pumpkins describe all things that are physical and tangible, real and solid -- things you can taste and smell, and of course, count. The Ghost cards are haunted by the ancient element of Water, the symbol of the fluidity of the subconscious mind, dreams, instincts, and emotions. The Bats comprise the 'thinking suit,' reflecting a bat version of the intellect -- the uncannily sensitive 'radar' of these nocturnal creatures that helps them find food and avoid collisions even on the blackest of Halloween nights. 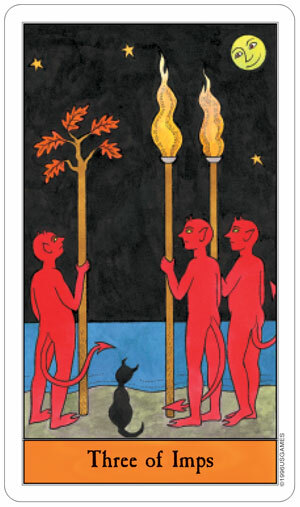 Since the traditional Tarot suit of Wands is linked with the ancient element Fire, the devilish scarlet Imps make a delightful Halloween suit equivalent." Cards measure about 4-3/4" tall x 2-3/4" wide (approx. 12 cm x 7 cm).